Where am I? > Home > Travel Insurance Quotes > Medical Travel Insurance > Blood pressure testing - at the pub? Blood pressure testing - at the pub? Holidaymakers heading off by train will soon be able to check their blood pressure at the station, as part of a new scheme aimed at boosting the number of people getting checked. The £1.5 million scheme by the British Heart Foundation (BHF) will see testing centres pop-up in train stations, hair salons and even pubs throughout the UK. It is hoped that bringing testing centres into communities across the country will help reach thousands of people who are less likely to go to their GP for a blood pressure check. BHF estimate that seven million people in the UK are living with undiagnosed high blood pressure, putting them at risk of a heart attack or stroke. Jacob West, director of healthcare innovation at BHF, said: "We urgently need to find the millions of people across the UK living with undiagnosed high blood pressure. "This means learning from countries like Canada, where knowing your blood pressure has become as common as knowing your weight or Pin code. "This has led to vast improvements in diagnosis and treatment of high blood pressure in Canada, where widespread access to community-based testing models is now the rule rather than the exception. "Now it's our turn to take high blood pressure seriously and find the missing seven million." The BHF is funding 15 projects nationwide during the next two years, with each expected to test the blood pressure of 5,000 people per year. The outreach programmes, some of which are already running, will offer testing in community locations including pubs, betting shops, barbers and job centres. 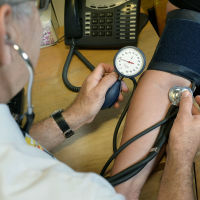 Professor Jamie Waterall, national lead for cardiovascular disease prevention at Public Health England, said: "High blood pressure is the leading cause of heart attacks and strokes, but it is largely preventable and easily treated. "Improving access to checks will help more people find out whether they have high blood pressure and what they can do to lower it." Leeds, Greenwich, Lambeth and Southwark are among the areas which will benefit from the programme. If you suffer from high blood pressure and are looking for travel insurance tailor-made to your medical needs, check out our dedicated high blood pressure travel insurance.